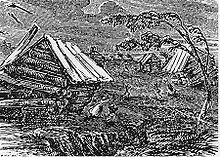 Woodcut of the New Madrid Earthquake, that happened in 1811. It is the biggest earthquake in the history of the US, east of the Rocky Mountains. It is classifired as level IX (heavy shaking) on the Mercalli intensity scale. It probably had a magnitude of between 7.5 and 7.9 on the Richter scale. An active fault is a fault that is likely to become the source of another earthquake sometime in the future. Faults are active if there has been movement seen or evidence of seismic activity during the last 10,000 years. Active faulting is considered to be a geologic hazard. It is related to earthquakes as a cause. ↑ "Active fault". Earthquake Glossary. USGS Earthquake Hazards Program. 2009. Retrieved 2011-09-17. Measurements of New Madrid Seismic Zone, the zone where the earthquake struck. Thr active fault is shown in red. This page was last changed on 5 May 2018, at 19:57.